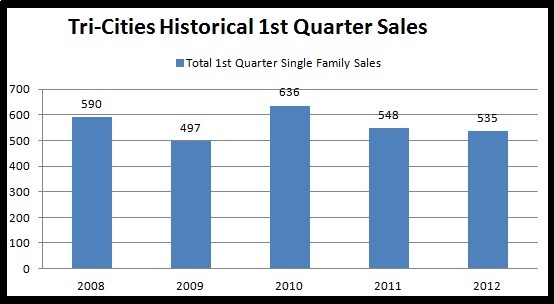 We’d like to report on the first quarter 2012 home sales in the Tri-Cities. Generally statistics are given for the entire MLS, but we like to break it down for the majority of our clients, who are selling or buying single family homes within the Tri-Cities: Richland, Pasco, Kennewick (we include West Richland too). The number of sales has remained steady throughout the winter and carried through to January and February. We see the typical increase during March as warmer weather moves in and more houses hit the market. The total sales for the first quarter were 535, plus 362 more under contract. 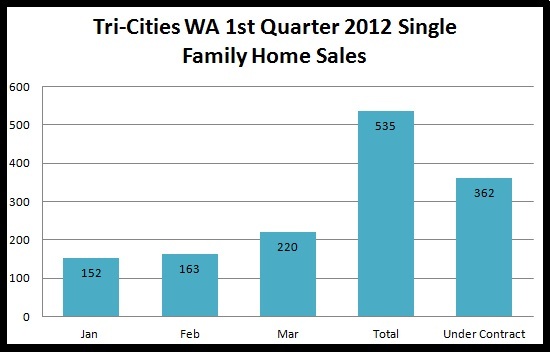 Keep in mind the numbers on these charts reflect only the 3 Tri-Cities plus West Richland, and only single family home sales. How do these numbers measure up to historical sales? We compared this quarter’s sales to the first quarter sales from the previous four years. The difference between this year and last year was only 13 homes. The previous year, 2010, was higher, but keep in mind many of those sales were the result of the tax credit to first-time and long-time homebuyers. In general, the market has remained steady and houses that are competitively priced are selling. We follow the market statistics closely so we can advise you on current sales trends. When you list with us, we keep you informed with recent listings and sales in your neighborhood so you always have up-to-date information about your competition. If you have any questions about statistics, market values, or sales trends in your area, don’t hesitate to give us a call!